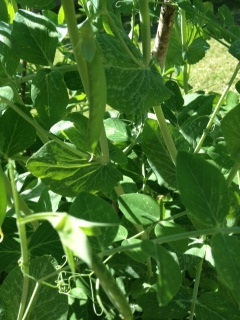 Sugar Snap Peas are a lovely addition to your garden and grow about 3 feet tall. Plant your seeds in the spring and in two months you will have delicious farm to table in 30 seconds as you walk your crop from the back yard. The recipe is very simple. 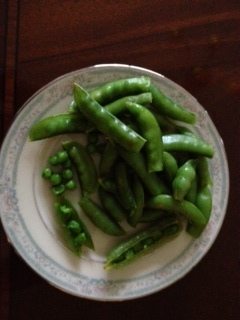 Snap off one end of the pea, toss in boiling water till it turns bright green and serve. This only takes 5-10 seconds so stay close and be attentive to your peas and q’s! We had a nice surprise in our planter this morning. 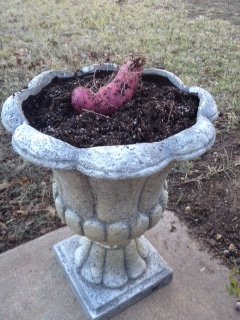 The beautiful lavender and burgundy sweet potato flowers produced one lovely potato.